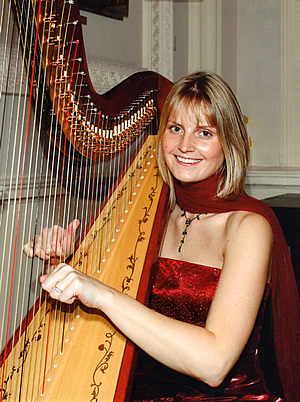 Welcome to the web site of Georgina Cornock a renowned Welsh Harpist. 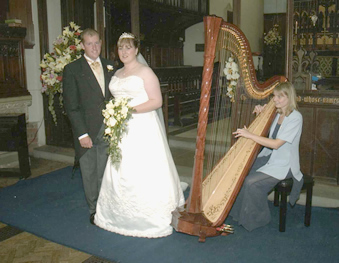 She performs in Concerts and Weddings and is also currently a harp teacher. Georgina's music career began at the age of seven back home in Fishguard, Wales. She has over 20 years experiance playing the Harp and has obtained her Grade 8 with Trinity College, London. 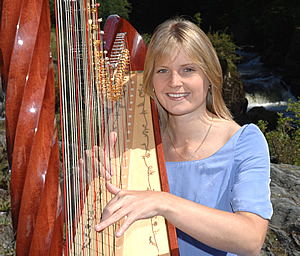 Georgina has been tutored by many recongnised harp tutors within Wales - Marion Thomas and Buddeg Stephens. 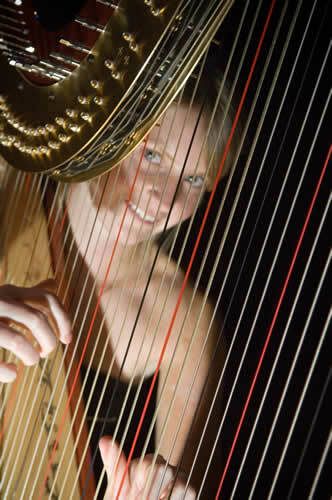 She is currently studying further with Caryl Thomas, working towards her Diploma in Teaching on the Harp. Georgina now lives on the outskirts of Lampeter, she is still pursing her career in music, teaching young children back home in Pembrokeshire and Ceredigion as well as performing at various concerts and recitials. 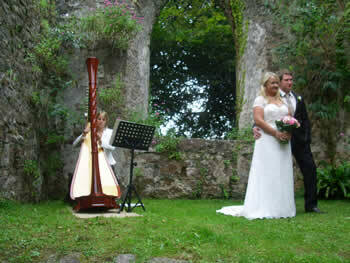 Georgina is currently the resident harpist for Slebech Park and Bluestone both in Pembrokeshire. She plays extensively for conferences and corporate events in numerous hotels and various tourist locations such as The National Botanic Gardens of Wales, Carmarthenshire and Pembrokeshire Agricultural Society Annual Show. She has performed around Wales, France and Ireland as a Harp Soloist and accompanist to Glancleddau Folk Dancers, Georgina has also accompanied them at the National Eist	eddfod on numerous occasions. She tool part in the 100 Harps concert for the Pontypridd 2006 Anniversary Celebrations. Her highlights are performing in 2008 as a soloist for His Highness Prince Phillip 'The Duke of Edinburgh' during his visit to Ceredigion. She has also had the privilege the same year to perform at The Mansion House London for The Right Honourable The Lord Mayor Alderman David Lewis. She has also performed at the Royal Albert Hall, London with Cor Iau Newyddion Da and performed at the Wales Millennium Centre as part of the Wales Young Farmers Federation 60th Gala Concert. Georgina accompanies her sister Joy Cornock vocalist at various functions and concerts. The sisters have also released a CD "Loving Harmony" in 2000 which can be purchased from themselves. Audio samples from this CD can be heard with Georgina's Music selection. Georgina performs on a Salvi Apollo Harp, which was made in italy in 2005 - it is made from mahogany and features a decorated soundboard. Georgina Cornock is available for : Church Weddings, Civil weddings, wedding Receptions, Solo Rectials, Concert Tours, Private Functions, Funerals and Tuition. Please click the right arrow ( ) to change between the two playlists. On booking the harp for your occasion it is advisable to arrange a meeting to choose which music will make your occasion that extra special.